Modular Asphalt Batch Mixing Plant mainly including: cold aggregate supply system, drum dryer, burning system, hot aggregate elevator, vibrating screen, weighing system, mixing tower, dust collecting system, filler supply system, bitumen supply system, electronic control system, finished asphalt storage bin. 1. 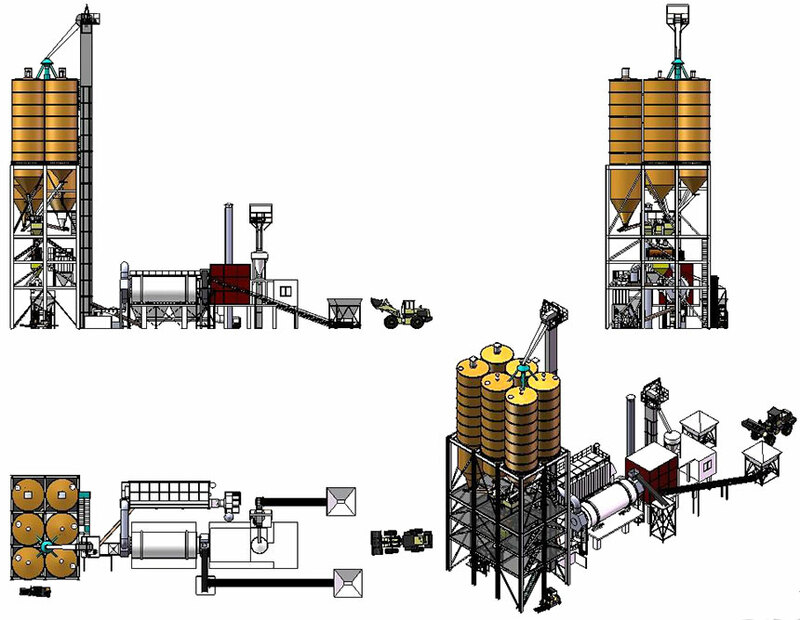 The original modular design of the mixing plant makes transport and installation work quick and convenient. It can separate extra-large flotsam from usable stuff. 2. The loop belt feeder for the measuring hopper has a frequency-conversion speed regulator which can provide high and low speed. Its original structure facilitates belt change and makes material feeding more fluent, which reduces power consumption. Besides, there is a warning light which will remind the user when the machine uses up raw material. 5. The hot aggregate bin is equipped with a continuous level indicator which enables the operator to know the level of material at a glance. The measurement of aggregate is conducted twice through large and small doors, which greatly improves the measuring precision. The unique structure of the material emptying door reduces the chance of blockage and will work more reliably. 6. The main mixing machine designed with European technology has double reducers with a high-speed synchronization capacity. Accurately-weighed asphalt can be directly pumped into the agitating kettle and powder material can be conveyed into the agitating kettle through the helix, which makes agitating more even and speedy. Besides, it has an opening to add wood fiber and an inlet to add used material to be recycled. 7. The dust-removing system adopts imported NOMEX bags which limit the density of dust discharged into the air within 50mg/m³, which is completely up to the national standard of environmental protection. The dust blown down will be collected into the collection tank through the dust lifter for reuse to avoid secondary pollution. 8. The control system adopts the SIEMENS integrated solution which plays a leading role in the industrial automation field. It also uses the PROFIBUS field bus to form a large and medium-sized distributed automatic system. In operation, the equipment adopts the technology of double hot standby on the industrial computer, dynamic display and buttonless design. All operations are done through the mouse. It has the real-time fault monitoring and control system with functions like parameter setting, data management and fault diagnosis. It measures precisely and can be controlled automatically, semi-automatically and manually, showing a stable and reliable performance.